Which climate change papers ‘matter’? | Climate Etc. Which climate change papers ‘matter’? A recent series of posts by Climate Brief has some interesting answers and raises some important questions. What are the most influential climate change papers of all time? 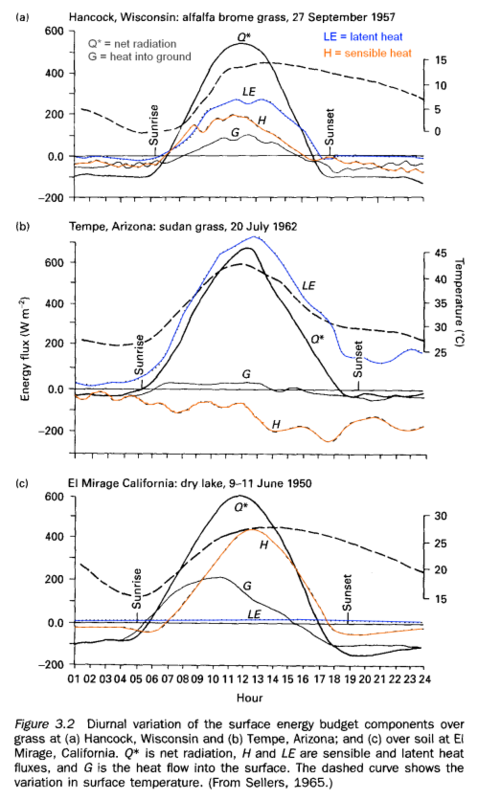 Winner: Manabe & Wetherald ( 1967) “Thermal Equilibrium of the Atmosphere with a Given Distribution of Relative Humidity”, the work was the first to represent the fundamental elements of the Earth’s climate in a computer model, and to explore what doubling carbon dioxide (CO2) would do to global temperature. Also in joint second place: Held, I.M. & Soden, B.J. (2006) “Robust Responses of the Hydrological Cycle to Global Warming“. Read the original article for other papers that ranked highly. No surprises here; these papers are certainly plausible choices for most influential papers. Standing the test time, and continuing to be regarded as important, is something that few scientific papers manage to accomplish. It seems that Earth and Planetary Sciences, which is presumably where the field of climate dynamics lives (e.g WG1 topics), is the source of only a small fraction of papers using ‘climate change’ in their titles or abstracts. I am familiar with the work of 3 scientists on this list, and have vaguely heard of a few others. I suspect that most climate dynamics papers don’t have ‘climate change’ or ‘global warming’ in the title/abstract and hence wouldn’t be counted. In any event, climate dynamics authors may not be as prolific as authors writing in these ancillary subfields (covered by WG2 and WG3), particularly agricultural and biologic sciences. The top paper, with 3,305 citations, is ” A globally coherent fingerprint of climate change impacts across natural systems”, by Camille Parmesan and Gary Yohe. In runners-up spot is an Ecological Modelling paper from 2000, ” Predictive habitat distribution models in ecology”, with 2,746 citations by Antoine Guisan, and Niklaus Zimmerman . And coming in third is ” Extinction risk from climate change”, with 2,562 citations by Chris Thomas et al.. I have read none of these papers (although I have heard of the paper by Parmesan and Yohe). There seems to be an enormous cottage industry of scientists in ancillary subfields writing a lot of papers about climate change impacts, that dominate the climate change literature (and probably the funding, if it was tracked). Will any of these papers stand the test of time like the Manabe and Wetherald paper has? I suspect that nearly all these papers from the ancillary subfields implicitly assume (97% and all that) that recent climate change is attributed to humans (without having any first order understanding of climate dynamics and climate change attribution). Especially if humans turn out not to be the dominant cause of recent climate change and particularly extreme events, these publications will not stand the test of time and and the cottage industry of climate impacts will shrivel. We shall see. The third article in this series by Carbon Brief is The climate change papers most featured in the media. Articles since July 2011 were tracked using altmetrics that measure mainstream and social media attention. The article coming out on top is “Quantifying the consensus on anthropogenic global warming in the scientific literature” by lead author John Cook. Coming in second, with a score of 1,733, is ” The geographical distribution of fossil fuels unused when limiting global warming to two degrees” by Christophe McGlade and Paul Ekins. Third place goes to Projected increases in lightning strikes in the United States due to global warming, by David Romps. Fifth is James Hansen’s paper Assessing ‘dangerous climate change’: Required reduction of carbon emissions to protect young people, future generations and nature. Sixth place: Matthew England, Recent identification of wind-driven circulation in the Pacific and the ongoing warming hiatus. Seventh place: Jim Hansen, Public perception of climate change and the new climate dice. Eighth place: Aaron Davis, The impact of climate change on indigenous Arabica coffee: predicting future trends and identifying priorities. This list makes me want to tear my hair out. I’ve read four of these papers, and have read about another 4 (haven’t previously heard of 2). At least half of these papers have been debunked either in the blogosphere or in the journals (the turn around time to get a comment actually published is quite slow, and the author of the original paper has lots of opportunity to slow down the process). More than 25% of the top 100 papers were published by Nature Climate Change. Nature Climate Change is clearly going for the headlines/altmetrics, with the unfortunate result that a substantial fraction of their highest profile papers don’t even survive their press release. I find Carbon Brief’s analyses to be pretty insightful, particularly when considered together. As a research scientist, I aspire to have published a handful of papers that continue to be cited 20 years after the date of publication – I would define that to indicate ‘standing the test of time.’ If a paper stands the test of time AND garners a significant number of citations in terms of influencing the direction of a line of research, well I would call that genuine scientific impact. University faculty members are evaluated on the impact of their publications. Obviously publications by young scientists can’t easily be evaluated for genuine impact (since by definition they haven’t stood the test of time). I suspect that the ‘flash’ associated with media attention may be becoming a substitute for genuine impact, especially at the second tier of research universities (below say the top 20). I also suspect that research funding success is not uncorrelated to ‘flash’ media attention. If my suspicions are correct, then the message that we are giving young researchers as to how to ‘succeed’ is not commensurate with producing papers of genuine importance and lasting impact. So, should the success of a scientist rely on issuing a press release and being savvy about social media? Scientists are encouraged to communicate their research to the public (I certainly applaud this), but media hits should not be a desired end in itself for scientists. However, scientists with a high public profile in the media often receive substantial professional recognition and prestigious appointments. Sometimes a high public profile is associated with substantial contributions; but too often it is associated with dubious science, advocacy and tribal leadership. Junk science can ‘pay’. This is a disturbing situation for climate science, and I hope to see more analyses along these lines to shine a light and better understand the dynamics of scientific publishing in the field of climate science. I took two things from this. Second, unlike Judy, the dominance by natural scientists. Gary Yohe and I are the only two card-carrying social scientists. (John Cook has yet to be awarded his card.) The anthropocene has yet to start in climate research. Congratulations, Richard, on getting listed. 1st was the original publication release – it got significant “early” attention world wide Q:- HOW?WHY? …. Did Cook manipulate the MSM by “BLOCKBUSTER” advertising to all CAGW MSM the “97% consensus” himself (or encourage green/watermelon/CAGW others to do it for him)?? 3rd it became “CAGW SPEAK” = a phrase unto itself, instantly recognised i.e. “I’ll be back” etc. etc. It would be really interesting to see a critical/social analysis/review of the history, effect and influence of this paper because like it or not it has had a significant influence on the debate!! And we’ve only gone down the crapper since then. Pivotal moment. In hindsight, the work of researchers that have not mechanistically hung their hats on the monocausal hook of increased human-produced atmospheric CO2 as the sole factor in global warming during the last half of the 20th century have been the only serious scientific attempts at helping to understand nature. You make an excellent, and funny, point. Sometimein the future, we will find most research and associated publications resting in the dung heaps of history, recognized as false, useless and ignored. true. rewrites after 20 years greatly improve the end product. I’ve only had time to scan the Parmesan & Yohe paper, but I’d say they’re showing a “fingerprint” of increasing global average temperature irrespective of cause. I’d be interested to see a re-do: if the “pause” also shows a fingerprint. As much as I would like to commend the work of a fellow Longhorn, Camille Parmesan’s research does not deserve it. From what I’ve read about her work, Camille Parmesan is a candidate poster girl for adovacy science. She should team up with the polar bear guys. They were made for each other. Long-term studies encompass periods of climate cooling as well as warming. If the distributions of species are truly driven by climate trends, these species should show opposite responses to cooling and warming periods. Such sign switching has been documented in the United Kingdom for marine fish, limpets, barnacles and zooplankton40, in the United Kingdom and Estonia for birds20,31,44,45, and in the United Kingdom, Finland and Sweden for butterflies17,46–48 (see also Table 3 legend). A typical pattern includes northward range shifts during the two twentieth-century warming periods (1930–45 and 1975–99), and southward shifts during the intervening cooling period (1950–70). No species showed opposing temporal trends (Table 3). While I’m skeptical of “global” trends based on correlation with other “global” trends, the correlation here seems to be with “global” temperature trends, irrespective of cause. Big difference between migrations and extinctions. I agree that local environmental changes matter. Indeed. Jim Steele has an entire series of excepts posted on WUWT which crushing deconstruct the shoddy science employed by Parmesan in her highly cited paper. Essentially massive cherry picking along with (deliberate or otherwise) unusually poor length and breadth of understanding of the study subject, study area, and conclusions. Add in the usual refusals to provide data – and you have the biological equivalent of Mann. A more specific example: a large number of the study areas in Parmesan’s research were not even “natural”: they were artificially created open areas opened by logging. Unsurprisingly, the stability of these areas cannot be the same as the normal natural habitat of said butterflies, and equally the fact that these areas were both out of “normal” habitat range and isolated meant that collectively, these areas are all unusually sensitive to depopulation (and later repopulation). I attempted to replicate Parmesan’s first study, but locations and designations were not available in her Nature publication and she refused to supply and data when requested. So a “re-do” has been thwarted and I suspect because she and her husband have now found those extinct population have now thriving, that her prevention of a replicated study is intended to keep her false climate change interpretation alive. AK’s the correlation here seems to be with “global” temperature trends, irrespective of cause. The objective of Main Stream and Social Media is to deliver eyeballs to advertisers. The objective of scientists is to be promoted in Main Stream and Social Media. In summary, the objective of scientists is to deliver eyeballs to advertisers. They can write all the papers they want but what matters are the predictions and the why behind the predictions. It looks like since so many papers are tied to AGW theory they will likely be obsolete going forward as this theory falters more and more with each passing month. Not one of the papers in favor of AGW theory can reconcile the historical temperature trend especially since the Holocene Optimum – Present Day. I can , and that does not mean I am 100% correct, but at least my approach conforms to the data and tries to build around what the data shows ,rather then papers which favor AGW which will twist and turn the data to make it appear AGW theory is correct and have the data conform to it. The reality being the correlation to increasing CO2 versus the temperature and leading the temperature is poor to say the least. It just is not present. The semantic method chosen probably skews the results, just as you suggest. Impact studies will necessarily talk about climate change and global warming, because that is their starting point, while physics and chemistry studies will not. By the same token, the primary use of citations is in the beginning of a paper, where the reason for the research is explained and knowledge of the field demonstrated. The very highly cited papers listed above are probably required to be cited in certain sorts of studies, because of their general nature. This is all what is called bibliometrics and it is tricky stuff. So far as I can tell, impact studies do not dominate climate research funding, but they are a substantial component. And yes they typically assume CAGW. As for the new altmetrics, they measure something other than scientific impact. What that is, is still unclear, so an interesting scientific question and one I play with. I doubt they carry much weight at this point. In fact they can measure negative impact as easily as positive, a problem that the altmetrics community is working to solve. > And yes they typically assume CAGW. A quote might be nice. Not sure what you mean by a quote, but the ones I have seen typically assume a warming of from 3.5 to 6 degrees C., or a big increase in rainfall and flooding, or a lot of drought, etc. Basically the core features of CAGW. The really big one is the multi-million dollar, multi-year US National Climate Assessment, or as I call it, the National Scare. http://nca2014.globalchange.gov/. Then there is the recent draft USGCRP Climate & Health Assessment. http://www.globalchange.gov/health-assessment. Pure CAGW. , but the ones I have seen typically assume a warming of from 3.5 to 6 degrees C.
I apologize to Willard for butting in, but do you have any examples of this? > Not sure what you mean by a quote. By “quote” I mean a quote, DavidW. An excerpt where we can see what warrants this CAGW meme. Your “assume” deserves due diligence. Handwaving citations is easy. It’s even required when brandishing a strawman. How would “a quote” prove anything about the claim “they typically assume CAGW”. wee willy? You are slipping. You used to be a precise little troll. If you can quote econometricians saying “assume a can opener” you can show that they indeed assume a can opener, Don Don. Quoting Denizens saying “pure CAGW” show that they assume CAGW exists. Etc. We all know that David’s observation is in the ballpark, so he doesn’t has to show you no stinking quotes. Vayansen! Ballpark of what, Don Don: are you suggesting that 3C will lead to a catastrophe? A quote means a link to a pay-walled pal review paper In a journal nobody reads because it costs too much and is likely (h/t IPCC) faked and will never be duplicated. That’s a quote. Nothing else counts. Personally, I like Yogi Berra and Dr. Feynman quotes, like it ain’t over till it’s over, 50% man made and 90% natural, and if it isn’t supported by observations you have to chuck it. One of my favorite quotes is from a guy named Paul, in a letter to a group of people who were caving in to consensus, who said, “…he who thinks he is something, when he is really nothing, is deluded…” I could give you a link but it wouldn’t pass moderation – lets just say it is in an old book that has been reviewed by hundreds of millions. This quote shows that the CAGW meme Denizens sloganeer day on day out is ambiguous. For AndyW, it’s promoted in the media, by the world leaders, and elsewhere. For DavidW, it’s an assumption in most papers, papers that nobody reads according to JustinW. Annoying Denizens seems a petty avocation for a grown man. Don’t you care about the CAGW meme as much as Da Paws meme, Don Don? Given a planet of 7 billion people, a big sample size, the number of people that read, say, “Planetary Atmosperes”, is virtually zero. However, if something is published that supports the CAGW meme, some media reporter that never got beyond fractions will grab it and weave it into the thermageddon narrative. Your “if something is published that supports the CAGW meme” seems to minimize what DavidW is claiming. He’s claiming that virtually every impact study assumes CAGW. Moreover, if impact studies assume and support the CAGW, that means Denizens can’t claim CAGW does not follow from the lichurchur. Considering the same “sample” size, virtually zero Denizen read Judy’s. Yet, it might be considered high profile. Too often it is associated with underdetermined concerns, advocacy and tribal leadership. Blogging concerns can ‘pay’. I havent read more than a handful of impact studies. David’s assertion seems false on its face to me. he should do his own damn science and MAKE A CASE about the prevalence of the CAGW message. For example… he could take Cook’s approach and do some rating and topic modelling. But since David argues by assertion I will to. There are No examples of CAGW in the impact literature. NONE, zero nada.. david is a fraud to suggest that there is. Wow,, fun and easy claim claim claim and then attack.. They don’t call them “impact studies” for nothing. There’s your quote. If there’s nothing happening, there can be no impact to study. Since impact studies exist, they must be assuming something is happening. They are certainly not proving the impacting factor themselves, otherwise they wouldn’t be impact studies. They are attempting to demonstrate the impact of a given proposition. The given proposition is assumed. The proposition in this case is that there will be rapidly warming atmospheric temperatures in the future. Who would waste their time assuming nothing changes and running impact studies on that? > They don’t call them “impact studies” for nothing. The name “impact studies” implies CAGW. Fascinating. > If there’s nothing happening, there can be no impact to study. If there’s something happening, then CAGW. Wonderful. > Since impact studies exist, they must be assuming something is happening. Since impact studies assume something is happening, CAGW. Amazing. That quote only shows that the consultant the Heartland institute hired to build up a K-12 climate curriculum built around the CAGW meme believes his meme is pervasive in the lichurchur. It doesn’t show anything about that lichurchur, TimG. The best way to show what’s in the lichurchur is to quote it. Time to call that softball rule, where the contest ends when one side is up by more than 20 runs. Justin managed that in one at bat against Willard, who barely got his off his shoulder. Joseph, as usual, never got into the game. I’m going to suggest that we have an adult conversation about this. I’ve never understood completely the whole CAGW issue. Are we talking about the claim..
Are both CAGW? or just one. This is a simple question. generally if you introduce a term or acronym it’s fair for people to ask you what you mean by that term or what that term ‘picks out’ in the world. Without addressing the truth or falsity of the claims here, without assessing who started it, or any off topic stuff, can we get clear on terminology. Do you really need any other links? Starbucks is doomed! Well, How I interpret, and use, the term CAGW is that AGW is understood to be certain, or likely enough, to lead to catastrophe that the whole issue is too urgent to waste time arguing about what needs to be done. Usually, the CAGW types then go on about how anybody who wants to stop and think “doesn’t want to do anything” about it. That seems to fit the behavior pattern. I suppose other people use the term differently, especially those who really don’t want to do anything at all about it. Hmm looking at the abstract willard provided it would appear that they did a reasonable assessment of the potential risk. If a right wing nut job says that we need to build a fence because some ISIS guys may sneak over the boarder, that’s not alarmism catastrophism. 3. A call for immediate action. Now, catastrophe is of course something like utter failure. problem, if its certain, then there is nothing you can do. Willard, there can be no greater catastrophic than the loss of my beloved Arabica though Robusta ain’t that bad.. Since 2001 according to Google Scholar there are 4000 plus results for the term “catastrophic climate change” in quotes. The media likes to add a bit of hype, but there appears to be about 4000 plus “scientific” papers using the term as well. 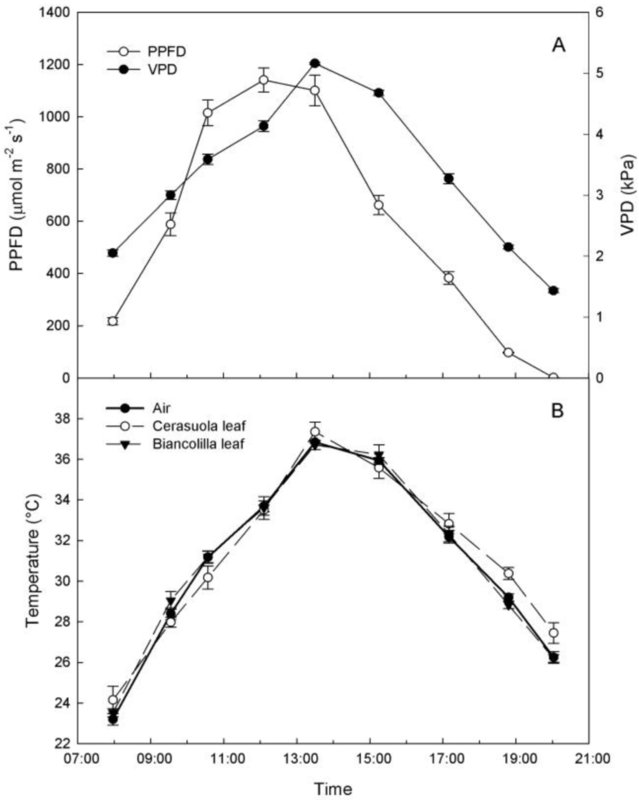 [D]ecreases in climatic suitability at lower altitudes and high latitudes, which may shift production among the major regions that produce Arabica coffee. But what if I told you that Judy’s may not be around to enjoy your morning coffee in 2050? Willard, Catastrophe lies in the fat tails, may, is a fat tail word. You take this crap way too seriously, Steven. You think Cook’s approach is science, Steven? Anyway, why argue about what Wojick says. Let him and willy work it out. “You think Cook’s approach is science, Steven? yes, Cook’s approach is science. I would criticize the EXECUTION of his project, but the approach is sound and well tested. The science is called content analysis. Why NOT argue about what Wojick claims? One of the more basic issues with the Cook analysis is I cannot find where it defines “climate scientist”. See this list: https://judithcurry.com/2015/07/10/which-climate-change-papers-matter/#comment-716965. So based on the methodology, if an MD (under the heading of “scientists publishing on climate change”) provided a peer reviewed article which offered a discussion on a drug to counteract the effects of “global warming” physiological or even psychological issues it could be included, could it not? After all, we’re not aware of the content of the papers within the 97% of the 33%. So while it may be science as “content analysis” is it “good science” in it’s use? (I am doing my “own damn science” as best I can). Fortunately the fat tail on climate sensitivity that Weitzman bases his paper on is increasingly being constrained (even if current publications in the economic literature like “Climate Sensitivity Uncertainty: When is Good News Bad?” Freeman et al slide past this). True, and that is probably at least partially responsible for “CARBON POLLUTION” another vague enough term to fatten a tail or two. If you throw enough crap in the mix something may stick. ‘So while it may be science as “content analysis” is it “good science” in it’s use? Yes, that is where I first used it long ago. Suppose I want to make a claim and argue that the Wall Street Journal takes a certain view. How do I quantify that over time? Well I have to analyze the content. is to analyze everything they wrote. Much better. The other cool thing is now in some areas you can automate the process of finding topics… really.. yup. Long ago when I was studying math and english there was zero work being done in this area. now at least I lived long enough to see some of the stuff we only dreamed about come true. Something I wish Cook had done was define “climate scientist” (don’t think he’d qualify). If you viewed the link to the earlier comment offered it appears many of those most cited also wouldn’t qualify. It seems that your “couple of articles” might apply equally to Cook’s work on a relative scale. For me, it’s one of the worst tools in the AGW arsenal. Of appox 12,000 articles survey’s only 4000 were used and 3880 is therefore the supporting number at 97%. I’m no math major, but from my view that’s nearer 32% (from 12,000) and is misleading. How it passed peer is bothersome and I’m no better than a rookie and often not a very good one. You didn’t seem to respond to the “good science” question. Current predictions of extinction risks from climate change vary widely depending on the specific assumptions and geographic and taxonomic focus of each study. I synthesized published studies in order to estimate a global mean extinction rate and determine which factors contribute the greatest uncertainty to climate change–induced extinction risks. Results suggest that extinction risks will accelerate with future global temperatures, threatening up to one in six species under current policies. Extinction risks were highest in South America, Australia, and New Zealand, and risks did not vary by taxonomic group. Realistic assumptions about extinction debt and dispersal capacity substantially increased extinction risks. We urgently need to adopt strategies that limit further climate change if we are to avoid an acceleration of global extinctions. Poster-child CAGW? With the “catastrophe” left to the readers’ imaginations. Cook never had any intention of doing science, Steven. Cook’s approach clearly was to create propaganda. And since the climate science establishment and the alarmist mass media like the kind of propaganda that Cook cooks up, his execution was just fine. Or maybe you have some reason to think his plan was to do science, but somehow he went astray and created propaganda. I don’t see any reason to worry about what Wojick says. He’s harmless. But maybe I am missing something. Do you think Wojick needs to be stopped? Number 2? A catastrophe is an utter failure or total collapse. 3 based on Pascal’s Wager. Hey what better source than hufpo? That is 17th century stuff now all we need are a few scientific witches to burn. Mosher assumes Cook was doing actual science? Cook’s ‘science’ was Cargo Cult Science. He was just going through the motions – but with the key difference that he also mocked up the great big pile of stuff the ‘Gods’ had landed at his airport …and every single box labelled ‘97%’. I’m having a hard time with this hothouse earth depriving the world of coffee story. Maybe you could help me out. You see, in my readings, of course, coffee, and in particular, arabica coffee comes from where the name implies: Arabia. In all fairness to Kenya however, it appears early on that Kenya plants made their way to Yemen. You being a charter captain and seafarer and all that, maybe you would confirm that Kenya and Arabia like Yemen are hot hot hot. I mean really hot. So the best tasting coffee bean comes originally from places that are really really hot. This is what confuses me about global temperature rising to unbearable levels, some crops really really “like it hot!” although with a mountain view. I was in Costa Rica this last spring and spent some time on a coffee plantation. The issues that these coffee farmers with which were faced had nothing to do with weather, or heat or mountains, it was that the coffee bean had to be harvested by HAND. Not all beans ripen at the same time. Pickers were payed by the “consualla ?sp? and only the cherry ripe bean would do. The major barrier for these coffee farmers was…labor. The young and able Costa Ricans don’t want to walk up hill and down dale to pick. So there is this illegal workers problem from the worker’s paradise of Daniel Ortega…Nicaragua. Lots and lots and lots of Nicaraguans are more than willing to cross the crocodile infested river waters to work, picking coffee in Costa Rica. The fundamental issue in coffee availability appear to me to be…labor. Now Brazil and Viet Nam grow coffee. And, the mechanical coffee bean pickers pick willy-nilly, ripe, not-so-ripe as well as the frankly “couldn’t-you-have-waited-a-couple-of weeks bean. And, instead of sorting, again labor intensive, all gets roasted and shipped, not to Starbucks or even Krogers, but to the “less discerning crowd” of the off-label markets. I am concerned of course, as my entire retirement portfolio is in Starbucks, so your statement: “Do you really need any other links? Starbucks is doomed!” is really of concern to me. Maybe I should switch to something safe to invest in like: carbon credits? Short the stock near term, but hedge for the long term with a call. Mountains become beaches shortly and land values should rise. Don’t worry about the labor issue, Moore’s Law will solve that problem. RiH008, I believe the potential Arabica catastrophe hinges on the loss of native, genetically pure, plants in Ethiopia, Kenya and the African tropical rain forests where Arabica supposedly originated. Arabians originated and had the monopoly on the coffee trade, hence Arabica. Costa Rican coffee production had a problem with colder than normal conditions a few years back, but there is still plenty of coffee production for the uncultured masses which I proudly belong to. Starbucks though might have problems with lower shelf beans. One marketing stunt – and now it’s a climate alarm marketing stunt – is to create the impression that arabica is the pinot of coffee, the delicate and tricky, as opposed to that coarse robusta, which must be everywhere. Arabica is another Bambi in the headlights, thanks to you-know-what. For example in reference to my last post a paper that takes the approach I take will not see the light of day because it is a threat to AGW theory. It is in other words a theory that can reconcile all the temperature changes from the Holocene Optimum to Present Day due to natural variability which the establishment does not want to hear. Race to the bottom. Where you land on John Cook. That got a wry smile. Thanks moso. Who got there by standing on the shoulders of Steve Lewandowski. The name of the game here is being correct and for the correct reasons, and saying it before it occurs. Nothing else matters. The now retired radio Dr. Dean Edell opined frequently that ‘directed’ research in medicine rarely brought breakthroughs but rather it was curiosity, often by bright researchers out of their field doing things other than what they were paid to do that came up with the innovative solutions and breakthrough understanding. Certainly no substitute for curiosity and those outside a field may be less likely polluted by the cognitive biases within. The average global temperature trend since 2001 is flat (average of the 5 reporting agencies http://endofgw.blogspot.com/). Graphs through 2014 have been added. Current measurements are within the range of random uncertainty with respect to the trend. Engineering science proves CO2 has no significant effect on climate. The proof and identification of the two factors that do cause reported climate change are at http://agwunveiled.blogspot.com (now with 5-year running-average smoothing of measured average global temperature (AGT), the near-perfect explanation of AGT since before 1900: R^2 = 0.97+ ). Exactly DAN, and this is going to get worse as we move forward into this decade and the temperature trend goes into a definitive down trend. They will still come up with spin and excuses. I hope at that time a much stronger stance will be taken against them from the likes of climate scientist that have some visibility. Dr. Judy Curry coming to mind. We will see if first the decline materializes and then what measures are taken to put this theory down if this happens. The problem with your analysis is that all 5 reporting agencies you mention show warming if you look at trends that are long enough such that the value of the trend is larger than the value of uncertainty (95%) in the trend. So in fact, the ongoing global temperature trend is up. 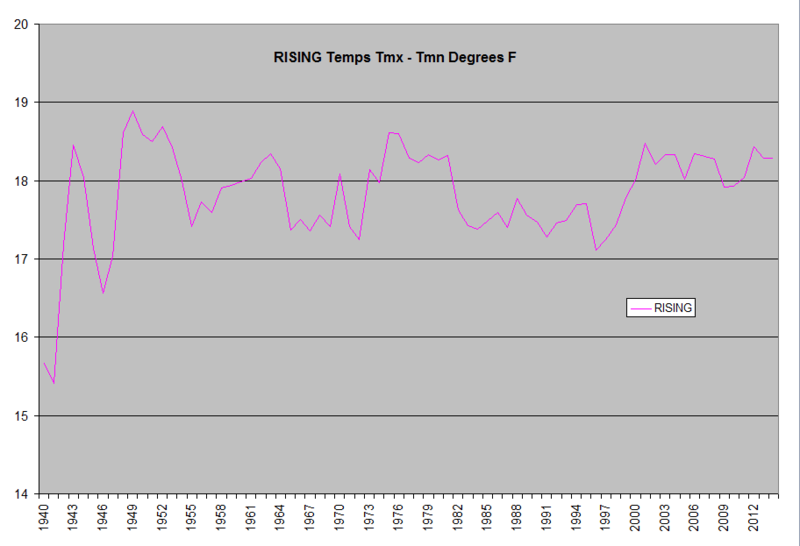 Only one reporting agency shows cooling since 2001, all others show warming. So the data actually agree with the theory that increased CO2 causes warming. Climate science has to explain how the planet can be getting warmer without the lower troposphere (radiosonde and satellite measurement) getting warmer. This is the “residual” difference day to day change averaged for a year. Notice how the years Rising jumps up, MX difference is almost all negative, that means that it’s cooling more at night than it warmed during the prior day. So how does temp go up, the same time it cools more at night? The excess warming is coming from warmer tropical areas, and then it cools over the continental areas. What is the trend for the radiosondes and lower troposphere temperature over the life of the measurements? Your theory that the lower troposphere and radiosondes getting colder doesn’t match the data. But you may consider that the AGW theory predicts that the stratosphere would cool with increasing greenhouse gases and you may find that the satellite measurements include the lower part of the stratosphere. the increase in absolute humidity and decrease in relative humidity allows more radiative cooling at night and more solar heating during the day. My best guess would be the reason it is cooling more at night while warming is because the increase in absolute humidity and decrease in relative humidity allows more radiative cooling at night and more solar heating during the day. 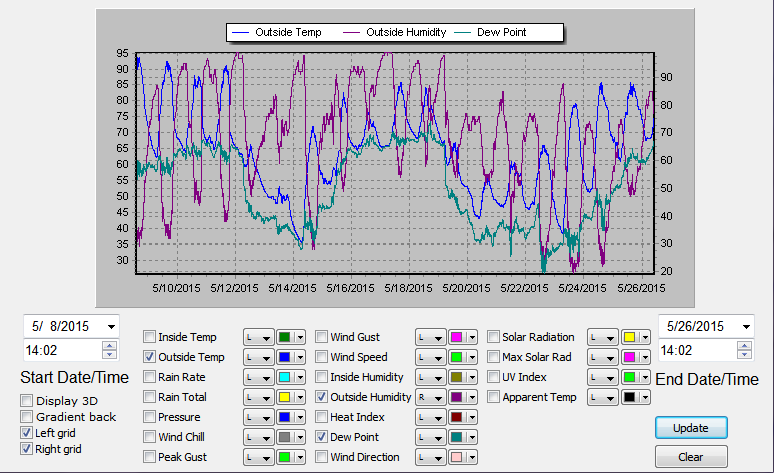 For a fixed temp, absolute humidity can’t go up without rel humidity going up. As for night time cooling it cools at the highest rate at Sunset, and slow towards morning when rel humidity goes up, since all of this night time cooling at moderate to high rel humidity generate dew, which has to radiate that energy away, and I think ultimately limits cooling rate. But you can see the rate of cooling change as rel humidity goes up, as well as seeing how daily temp range changes with rel humidity. This is due to a movement of the jet stream changing where the air came from, the low humidity days are Canadian air, humid days are tropical days. But I don’t see how thousands of land based stations can register a year of more night time cooling than the prior days warming without more heat from someplace. 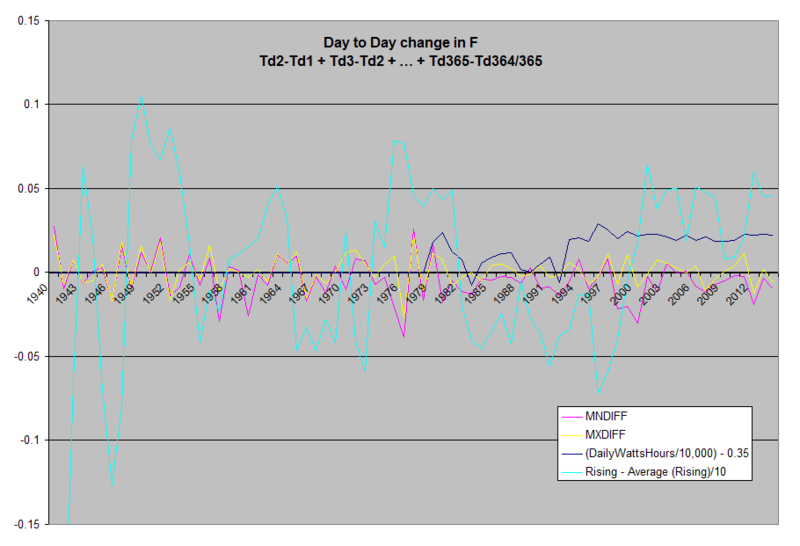 Oh, here’s the sum of day to day change in max temp divided by the sum of calculated solar forcing at the ground. Let me make a new version with max and min diff along with forcing efficiency. It’ll be easier to see how they fit time wise. With lots of scaling of Forcing and and Rising temp. True, but temp is going up. For fixed absolute humidity, if temp goes up, relative humidity goes down. For fixed absolute humidity, if temp goes down, relative humidity goes down. No, it goes up, that why night time cooling removes water vapor as temp nears dew point, rel humidity goes up. 8 % social sciences. 0% math (part of other one hopes). 90% assuming valid results of a big multiphase multiphysics solver no doubt. This paper caught my eye, as I think Rel humidity plays an important role in radiative cooling of the surface. But I didn’t get very far before I , well. First rel humidity changes every day, mostly because it cools at night, and rel humidity maxes out, which limits the humidity to daily temperature range, hence why rel humidity tracks temps. And as it warms up during the summer, since warmer air holds more water, rel humidity maxes out most nights, with drains the excess off as dew, some re-evaporates the next day, the rest ends up in the water table. Here’s what this looks like. You can see how it pegs rel humidity most of the summer. So as long as there’s free water (ie it’s humid) there is a natural control that limits it to temp. The next thing I noticed is that they modeled the surface as having zero thermal mass, and the reality is as compared to the ground, air has zero thermal mass, minus water vapor (which carries energy from the tropics poleward) and convection (which mostly stops most nights), air temps follow ground surface, or is limited by clouds. I tend to disagree. I believe increased absolute humidity increases warming. Temps (in particular night time temps) regulate absolute humidity, Water vapor carries a lot of energy with it (I’m pretty sure if it’s vapor it has to be over the boiling point), so, you’re right it’s warmer with more humidity, but it doesn’t see to limit night time cooling until rel humidity get to 80-90%, and I believe that’s just that it has to radiate away the energy that’s release as water vapor condenses as dew. 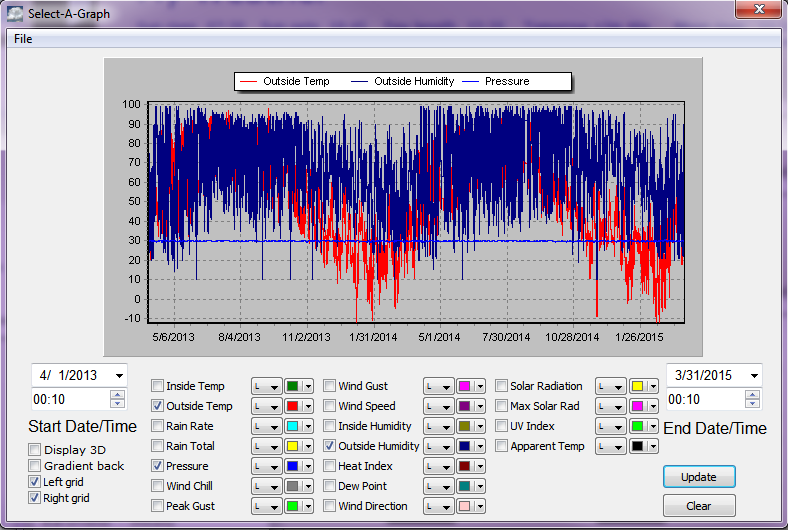 My weather station image shows how humidity slams in the the 100% limit most nights during the summer. Some of that water is lost to the water table, the rest evaporates the next day, which the following night when it condenses radiates all the energy that went into evaporating the water the day before. And because the higher the latitude the cooler the night, the less water vapor, the more tropical energy is lost to space, rinse and repeat. I am pretty sure this is wrong. water boils when the vapor pressure of the liquid is equal to the atmospheric pressure. You can dry something without heating it to the boiling point. It does this because was vapor pressure drops, boiling point drops as well, it’s why you can’t cook in boiling water at high aditude. And I confirmed the boiling /evaporation on wiki, but you are correct about boiling point dropping as pressure drops. The Thomas paper on extinctions is noted as third most cited. That does NOT speak well for all the citing papers. Thomas is an awful paper, dissected in guest post and essay No Bodies. Faulty extinction risk model, incorrect Z, gross species selection bias, climate model 2x what IPCC has (let alone reality). For example, 9 plant species used to model extinction risk for the over 80000 plant species in the Amazon. I thought science was self correcting over time. Apparently not climate science and its sequellae. Just about every paper I’ve seen on impacts to species is crap. Two of my favorite where the one on Andian birds – where the birds were not adjusting their range as predicted by the models, even though the climate was changing. The conclusion of the researchers was there was a problem with the birds. They apparently were not adapting quickly enough and were doomed. (Though I guess a secondary conclusion could be “stup*d birds, they can’t follow the models.”) I guess it never occured to them that perhaps it was a problem with the model. The other was similarly model based. They took model derived future ocean temperatures, matched those up with current fish ranges by temperature and then used another model to project how quickly they would adjust their range as temperature changed. Conclusion? The fish were not swimming fast enough and were doomed. it requires people to do their own damn science. This requires MORE THAN CRITICISM. Galileo was the first to estimate the speed of light. But pointing that out is not science. it is the beginning of science. The science moved on when the next guy did it better.. Pointing out errors is good. yeah QA!! You know, on a Friday night you could upset me. Holier than thow Berkeley Mosher, where is your analysis of Thomas? I published mine. > where is your analysis of Thomas? On the reverse the burden of proof in one single tu quoque. How to reverse, that is. Willard, I did not know you were reading challenged. Guest post No Bodies is the short version free here last year. Or, essay No Bodies on ebook Blowing Smoke, foreword JC, cheap on Amazon Kindle last year. Do try harder. For example on ATTP when the criticiized Monkton’s paper I told them to do their own damn science. That is, Publish a critique and improve on his work. You see those TWO STEPS.. critique and IMPROVE. I used to think critique was enough. Go back and read what I wrote. But long before berkeley I decided I was wrong. Critique is not enough, you have to make an attempt to improve understanding. In fact, when I was ask to join I showed up with what I thought was an improvement based on some work that Zeke menne williams and I had done. You may disagree with this assessment, but you cant disagree that I apply the same standard to all people. critique is not enough. So, now I tell you its not enough to critique. Thomas. I am silent on Thomas. I suspend judgement. IF I were to ONLY criticize him and ALSO argue that criticism was enough, then your logical fallacy (tu quoque.) might be less funny. Which part of “pointing errors is good, but that’s just a start” your “where is your analysis of Thomas” addresses exactly? One of the firmer catastrophic anthropogenic global warming (CAGW) predictions made by IPCC AR4 WG2 was an alarming increase in species extinctions. Do you have a quote for that prediction, by any chance? Seems I can’t find “catastrophic” nor “alarming” in 4.4.11. It would be a bit inconvenient to accuse the IPCC of using adjectives you yourself put into its mouth. Your “but polar bears” is quite cool too. “One single proof” is a deceptive rhetorical flourish used primarily by [contrarians] designed to apparently negate a preponderance of circumstantial evidence by claiming that without a specific key proof, the whole argument is invalid. The effectiveness of the technique is dependent on a sort of distortion of Occam’s razor whereby any evidence that does not provide the whole answer is ignored. Here’s my analysis of your analysis. Oh, and your analysis, or your argument. Bottom line is that it doesn’t matter what Mosher says. This is true. what matters is what you do. Mosher, agreed. Did ‘my own damn science’. You and Willard need to reply to my many specific science criticisms to Thomas, provided in a previous guest post here, and in a more extensive ebook essay, No Bodies. Gosh, even included additional species and lots of pictures for the math challenged amongst your ilk. So far, your evasions only suggest you have no substantive comebacks. Is that just the math, or includingn cute species like polar bears, penquins, pikas, ‘red wolbes’, or ring tail possums? Read Thomas pathetically atupid paper and my critique of it before blathering on. Or, keep digging a deeper hole. I don’t see why, Sir Rud, since I commited no claim on Thomas. Besides, I already showed that your overall argument might very well be invalid. Should I also recall how you stacked up your deck using anecdata? I predict the “climate change impacts” “cottage industry” will follow the Milankovitch cycle and not survive the next glaciation! AGW – I would keep a very leery eye on Antarctica and the Southern Ocean. The start of your doom perhaps? One conversation had with a CAGW/AGW proponent dismissed a famous skeptic as being “only a meteorologist” at the same time professing the value of “peer review” in the publication of scientific papers. This provides and interesting perspective to that conversation. Well, it’s Doctor Held, who earned his piled high and deep under the supervision of Doctor Manabe, but we should put more faith in Mr. I didn’t graduate from college? Or were you referring to another famous skeptic? but we should put more faith in Mr. I didn’t graduate from college? Valid point. Doctorates vs. college attendee (Anthony), but the statement from the AGW/CAGW (CAGW being the most focus from this individual) person who effectively tossed out all meteorologist’s (He’s a Hydrologist fyi, but does have a P.E.) as invalid as “sources” (which would eliminate Manabe and then I assume Held as one step removed). This thought process has made me wonder about the “97% of climate scientists” areas of background and then therefore their validity in his eyes under the same criteria. Thoughts? Based on my perception of this kind of thinking a large portion of the most prolific might not make the cut when defining “climate scientists”. Interesting to consider? Appropriate? Wonder what he think’s about Bill Nye the Publicity Guy? Well, I’d have to guess that as a Mechanical Engineer he’d be accepted unless of course he signed the Oregon Petition. Another problem with the line of thought. The first CLA of AR5 (https://www.ipcc.ch/pdf/ar5/ar5_authors_review_editors_updated.pdf) happens to be a Prof. of Meteorology (http://www.geo.fu-berlin.de/met/ag/klimod/MitarbeiterInnen/UlrichCubasch/)! I didn’t investigate further down the list. 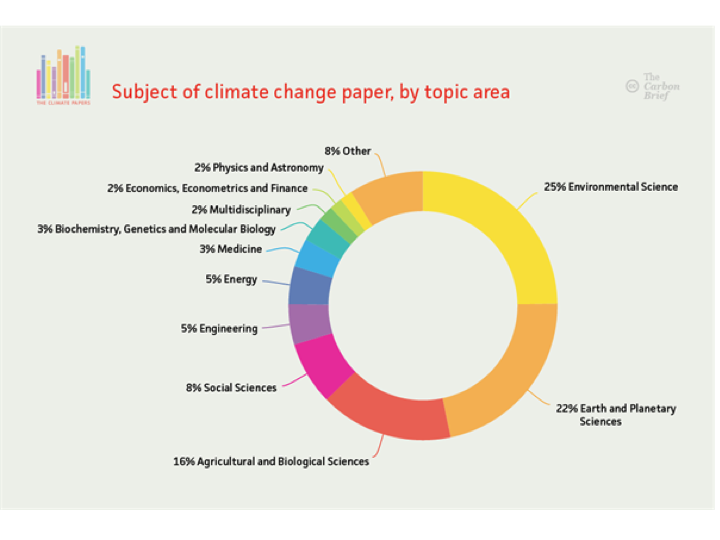 Wondering not just which papers matter, but in climateball, which authors? One of the interesting aspects of that paper was that the word “robust” referred to results that all of the models they reviewed have in common. Since the models are in the aggregate running hot, it could be reconsidered as “what all the climate models get wrong together.” NOT ROBUST with respect to planning for the future. The paper reported a 3% per C increase in global rainfall and a 7% increase in surface water vapor pressure per C increase in temperature. The result was included in the review by O’Gorman et al, which also included empirical results showing a 5% – 7% increase in global rainfall per C — a nonnegligable difference. To me, it is a symptom of the problems in the field at this time: much credence to a result that is clearly too inaccurate for the support of policy. fwiw, that is not a criticism of the authors, but a caution that their result is not as valuable as it is currently rated. Also from a modeling perspective, getting a 3% rainfall increase from the models when the true value is 5%-7% is a good modeling result; definitely worth building on instead of abandoning the modeling effort completely. It just is not accurate enough for policy prescriptions when one of the questions is: Will the increase in surface mean temp be closer to 0.3C or 1.5C per doubling of CO2 concentration? The model error is about as big as the predicted effect, and the modeling of the temperature is biased toward the high end. In my view the first actual measurement of the ground level CO2 effect, 0.2 W/m2 for 22 PPM.CO2 increase, is the most important paper. With climate change discretionary budget authority over $20 billion the last few years we have blown over $200 billion on climate change. The source of concern is increased surface IR forcing due an increase in CO2. The effect has been a policy concern starting in 1979. After all the models and estimating for 36 years with no actual knowledge a study actually measured the CO2 IR forcing change due to increasing CO2 levels. This is what the global warming discussion is all about. Climate science should be ashamed for making it the last thing on their list to study. What is interesting is that the announcements trumpeted the paper as proof the of CO2 effect. No one seems to have noticed that the effect is only 1/3 as great as estimated by the IPCC (1/3 the mean of their forcing estimate range – and below their “unlikely to be below” number). This says volumes about whether global warming is science or politics. As far as Parmesian (and other Mannian authors) there isn’t much to say except any study used by the government should have to survive a hostile review by people with an opposing viewpoint paid to find fault. None of these types of studies would survive for integrity/methodology reasons. “Robust” in the title refers to a lot of results that all of the models have in common. It is not a “robust good fit to out of sample data”. Inasmuch as the models are collectively running hot, the paper could be retitled “Why the models are running hot”. That is not a criticism of the authors. Robust in modelville is a misnomer. Common is closer. That paper has within it a derivation of the change in energy transferred from the surface to the “lightning layer” by advection/convection, that I hope gets a lot more play in the coming years. The two climate studies with the most impact (and likely references) in media have to be Mann’s hockey stick and Monnett’s polar bear silliness. For a study to have real import in the real world, measure how often the subject and “findings” are referenced in general terms. The fact that people talk about polar bears dying from global warming without any knowledge of Monnett explains just how mainstream the paper’s influence is. While Mann is much better known than Monnett, his hockey stick is still far better known. And yes, both these studies have been debunked. Actually, they’ve been exposed as brain dead incompetent. No doubt there is a connection to their widespread acceptance in the popular media. The connection is the powerful PR machines that made them famous, especially the IPCC with the hockey stick and the WWF with the bear stories. The most influential and important climate science papers which have appeared in the last fifteen to twenty years are not on Carbon Brief’s list. These are the series of Mann et al Hockey Stick papers starting in 1998 and continuing on through to the present. As a tool of modern climate science, the Hockey Stick in all of its forms is indispensable as strong circumstantial evidence in pointing the finger at rising GHG concentrations as the primary causative agent for the earth’s recent warming. If recent warming is indeed truly unprecedented, as the Hockey Stick papers indicate, then any problems which may exist with the GHG-forced climate models must be evaluated in light of knowledge that the climate system was relatively stable prior to the onset of the Industrial Revolution. The Hockey Stick is also indispensable as a climate science communication tool in clearly illustrating the influence rising CO2 concentrations have had on the earth’s climate system. The importance of the Hockey Stick papers is such that if any of the criticisms made against these papers were to be given serious credence by members of the larger scientific community, a fundamental tenant of climate science as a unique and separate scientific discipline would come into serious question. Climate science as a separate scientific discipline could not have attained the status it enjoys today if the Mann et al series of Hockey Stick papers hadn’t been published starting in the late 1990’s. Meant to put this here. Have you read Steve McKintyre’s work or Andrew Montford’s work that shreds the so called “Hockey Stick” along with Michael Mann? Mark Silbert, I’ve read everything Steve McIntyre has written concerning the Hockey Stick. I’m also aware of Andrew Montford’s a.k.a. Bishop Hill’s work. The great majority of climate scientists do not accept the detailed criticisms made of the Hockey Stick that appear on Climate Audit and in Bishop Hill’s books. The importance of the Hockey Stick in supporting modern climate science cannot be overstated. If there was nothing else but the Hockey Stick in pointing the finger at rising CO2 concentrations as the primary causative agent of recent global warming; and if the Hockey Stick was judged as being a reasonably accurate paleoclimate history of the last two-thousand years, there would be powerful justification on that basis alone for taking strong action against rising carbon emissions. Even the IPCC has down played the Hockey Stick in their latest assessment. If you are basing your call for a carbon tax on the Hockey Stick, you gonna lose. You need to be out working to try to reduce the cost of new nuclear plants rather than trying to kill natural gas with a carbon tax. The Nuclear Industry has a huge lobbying effort in this country that is doing squat to reduce the cost of nuclear while at the same time hoping for a carbon tax. Beta, you do know that the proxy handle math Mann et al used does not rise with the surface statistical model blade, it actually keeps going down, so they chose to hide this decline, right? I guess what you are saying is that the AGW scientific community embraced the hockey stick and ignored the skeptical criticisms. In that sense the hockey stuff was indeed important so I tend to agree with that sad assessment. Fortunately it also fueled climategate. Beta Blocker: “The great majority of climate scientists…” Well, there’s your problem. Real scientists follow the Scientific Method. Your “climate scientists” REFUSE to do so. They are not scientists, they are anti-science, anti-human political hacks who leech off taxpayers with lies about their “science”. “I can’t see either of these papers being in the next IPCC report. Kevin and I will keep them out somehow – even if we have to redefine what the peer-review literature is !” Phil Jones to Michael Mann. Beta, you are trying your disinformation campaign on people who know about Yamal, Upside-Down-Tijlander, Peter Gleick, 28Gate, etc. etc. etc. Steve McIntyre, Andrew Montford, Anthony Watts, are FAR more real scientists than the cretins you defend here. BB desperately clings to the ever shrinking stick. I agree. Using a stick to prop up a rapidly collapsing pile of rubbish is a good idea. Maybe a few more, and bigger, sticks are also needed. Have you got any to spare? Full disclosure here, I have spent thirty-five years working nuclear construction and operations in the United States. Concerning the importance of the Mann et al papers to climate science, I’ve been in a large room where climate scientists who work on the climate models were being asked questions by knowledgeable lay people who challenged the validity of the climate models and their focus on CO2 as the primary driver of climate change. These questions put much emphasis on the reasons for the recent pause in global warming. A key point made in defense of the climate models by the climate scientists who were in attendance at this meeting is that paleoclimate studies demonstrate that recent warming is anomalous in the 2000-year historical record; and that so far, only rising concentrations of CO2 offer a reasonable explanation for what is happening. These climate scientists acknowledged that their models aren’t perfect by any means, but the fact that paleoclimate studies point a very powerful finger at CO2 as being the most likely causative agent is good reason for spending more money on improving the models. In response to knowledgeable criticisms of the Mann et al Hockey Stick coming from the audience, the response from these climate scientists was that McIntyre’s analysis has been demonstrated to be faulty in a number of ways; that the Hockey Stick is as much a scientific fact as any fact can be; and that although there are different versions of the Hockey Stick which are slightly different from each other, they all reach the same general conclusion that recent warming is anomalous in the millennial temperature record. What about nuclear power and the need to put a price on carbon? President Obama’s stated goal is to reduce America’s carbon emissions 28% by 2025 and 80% by 2050. There is no way to reach this goal without substantial government intervention in the energy marketplace to raise the price of all carbon fuels. Raising the price of all fossil-fuel energy resources will encourage extensive energy conservation measures and a faster transition into some combination of nuclear and the renewables. Raising the price of carbon fuels isn’t enough just by itself. The only practical approach which can simultaneously curtail America’s demand for fossil-fuel energy and manage the growth in demand for non-carbon energy resources is to raise the price of all forms of energy across the board for all energy consumers. We cannot reduce America’s carbon emissions 28% by 2025 and 80% by 2050 unless all forms of energy become more expensive. The problem with nuclear is its much higher up-front capital costs in comparison with natural gas. The Nuclear Regulatory Commission and NQA-1 are not going away — not now, not tomorrow, not ever. If the small modular reactors don’t work out, the only way to reduce nuclear’s up-front capital cost is to build more large multi-reactor plants with the goal of tuning up the nuclear construction industry so as to reach the levels of efficiency it enjoyed in the early 1990’s. This process will not start unless the US Government puts a price on carbon. Going with nuclear and the renewables is strictly a public policy decision. Left to themselves, private investors will go with natural gas, because there is substantially less business risk in going that way. Gas-fired plants are cheaper to build than nuclear, and rising prices for natural gas can be passed on to consumers as they occur. If you are a businessman in an unregulated energy marketplace out to make a profit, building and operating gas-fired generation capacity is the way to do it. As an example of this kind of public policy decision, one which pushes the adoption of nuclear power, the US Southeast has made a conscious decision to pay an up-front premium for their new-build nuclear plants, doing so in trade for the expectation of a guaranteed long-term supply of electricity at stable energy prices. This is a gamble on the future of the nation’s energy marketplace. If natural gas prices do stay low over the next twenty-five to thirty years, the public policy decision the US Southeast has made will turn out to have been the wrong one. But what if the US Government puts a stiff price on carbon? In that case, the US Southeast stands to win big on its nuclear power gamble. Very, very big. Beta Blocker, you forgot the sarc tag. Mann, I trust your not serious else you have some real problems. JC –> “There seems to be an enormous cottage industry of scientists in ancillary subfields writing a lot of papers about climate change impacts that dominate the climate change literature (and probably the funding).” , if it was tracked. Will any of these papers stand the test of time like the Manabe and Wetherald paper has? I think this dramatically brings attention to the built in reinforcement of the consensus approach to climate science (and communication of). At some point when publication peer reviews, publication screening and research funding are dominated, the “herd leading” and “herd following” become the same thing. The cognitive bias and story line dwarf epistemological inquiry and when do individual payouts drive wants and desires into beliefs into scientific opinion. The usual answer is follow the money (and non monetary payouts). “As the climate changes, plants and animals are on the move. So far, many are redistributing in a similar pattern: As habitat that was once too cold warms up, species are expanding their ranges toward the poles, whereas boundaries closer to the equator have remained more static. Bumblebees, however, appear to be a disturbing exception, according to a study in Science today. A comprehensive look at dozens of species, it finds that many North American and European bumblebees are failing to “track” warming by colonizing new habitats north of their historic range. Simultaneously, they are disappearing from the southern portions of their range. There are more bees in the world now than ever before. We been stung by a dead bee. I read the abstract for “The geographical distribution of fossil fuels unused when limiting global warming to 2 °C” and looked at the graph thumbnails. I consider the product to be baloney. Their resource estimates are incredibly high. It’s interesting to see this was generated after the RCP8.5 came out using unsupported resource figures. It’s as if they wanted to plug the gap I and others had identified in the summer of 2013. I spent summer and fall of 2013 writing I thought rcp8.5 was weak. The paper was received in early 2014, published in 2015. It seems to be inconsistent with previous work coming out of the same shop. I suspect this was a “made to order” product to have “peer reviewed literature” backing the IPCC conga drums. By the way, it looks like the world hit peak crude oil and condensate in the first semester 2015. Production should continue dropping from now until 2016. Whether it recovers will depend on how aggressive producers will be as they see production falling and stocks starting to go down. Vahrenholt, F, and Luning, S, 2015, The neglected sun, 2nd ed: Arlington Heights, IL, Heartland Institute, 412 p.
Translated from: Vahrenholt, F, and Luning, S, 2012, Der kalte sonne: Berlin, Hoffman u Campe Vg GMBH (in German). (NB. Just as one shouldn’t judge a book by its cover, one shouldn’t judge a book by its publisher!). What none of these papers do is demonstrate that AGW exists. You nailed it. They have set the bar so low anybody gets accepted into the club. Warmists love misdirection. We all seem to accept that AGW really means AGW caused by man adding CO2 and H2O (amongst others) to the atmosphere, causing rising temperatures globally, by virtue of some mechanism not yet demonstrated, but rather, inferred. Nary a word to be heard about the possibility that AGW is actually AGW due to man’s continuous and unremitting production of heat, previously absent. This continues day and night, and of course creates CO2 and H2O as a consequence of the heat generation process. If you produce heat, you get warming. What is so complicated about that? You also get a lot of plant food produced at the same time! Seems like an all round winner to me! @MF: all the energy provided by the Sun during the day, is radiated away during the night. So the Earth has to radiate a total of 122,000 TW, not only during Mike’s night but even at his high noon, in order not to overheat. Nary a word to be heard about the possibility that AGW is actually AGW due to man’s continuous and unremitting production of heat, previously absent. Yet another excellent point by Mike. Unremittingly, humans produce 15 TW of heat, day in and day out. That’s 15 TJ of thermal energy per second. Now what would happen if it turned out that something so innocent as seeding clouds to make more rain, or switching jets to a cheaper brand of fuel, or setting fire to all the dinosaurs, by some crazy and totally unexpected means managed to interfere with a teeny tiny fraction of that 122,000 TW of escaping radiation, say to the tune of 0.1% or one part in a thousand? Well, the Earth would then find itself wondering what to do about the extra 122 TW of thermal energy that it was unable to shed. That plus the additional 15 TW of energy that all the world’s power plants are generating day in and day out, even while Mike is asleep. The atmosphere is a really delicate thing when you look at it that way. In order for our 15 TW to be the main heating agent, we would need to avoid changing the amount of heat radiated from Earth to space by anything more than about one part in ten thousand. A while back King Canute stood in the surf and commanded the tide to retreat. It didn’t, which was his point. One King Canute commanding an ocean to change by what would surely have to be at least 1% to be noticeable is one thing. Seven billion King Canutes commanding the atmosphere to increase its thermal resistance by 0.1% begins to come into the realm of feasibility. Numbers do make a difference. Today we have the manpower, the technology, and the insight into the thermal resistance of the atmosphere, to make a real difference to the planet’s temperature. Let’s do it! Onward and upward! What ever the amount is, it is getting radiated away most all of the 24 hours each day. Of course a thoughtful earth would probably decide it was getting a bit hot and open the windows a bit. The earth intercepts over 174 terawatts of solar energy. That is just the earth disk area * insolation and doesn’t include additional energy absorbed by the atmosphere (which increases the area of interception). Tell me again, how much insolation occurs at night? You may, or may not have noticed, that all the energy provided by the Sun during the day, is radiated away during the night. If this were not so, winter would not be colder than summer, and the Esrth could not have possibly cooled after four and a half billion years of heating by the Sun. It’s not an argument. It’s fact. You did not understand their explanation? It’s not even the sun that they compare it to, it’s the added CO2 that has 100 times more effect than all the burning put together. If H.G. Wells’ time traveler had gone back 10,000 years in time and explained thermal radiation to that period’s leading scientists, their take on it would likely be that an unseen hand switches off the Sun at dusk, thereby starting up thermal radiation to space, and turns it back on at dawn, thereby stopping the radiation to space. I can readily imagine that most people today see this phenomenon the same way. Present company excluded of course (Mike, are you on board or not?). @MF: It’s not an argument. It’s fact. 1 + 1 = 0. It’s not an argument. It’s fact. Rubbish. Last winter I took a trip to Australia and asked people how it compared to six months ago and they assured me it was definitely hotter now than then. When are you going to change your parochial pre-Galilean views of how the Sun heats the Earth? Your claim to “the facts” is undermined by your apparent belief in a flat Earth which the Sun deigns to warm every 12 hours out of 24, with radiation to space happening only at night. Maybe you are unaware that the Earth rotates on its axis, but I suspect you are just pretending you don’t know this. This, apparently, is the reason that surface dwellers experience “night” and “day”. Troglodytes would make no such distinction, but I don’t believe you live in a cave, although I concede that your writings demonstrate you are “in the dark” about many things. Maybe too much exposure to infectious Warmism. If you believe that the Earth warms up as it recedes from the Sun, good for you. Likewise with believing that the seasons occur at the same time in the Northern and Southern Hemispheres. Global warming would be a GoodThing ™, but there doesn’t seem to much of of it around at present. In spite of all your wishes, the Earth has been cooling for four and a half billion years. Any point on Earth will be warmer when it is closer to the Sun, a consequence of the Earths elliptical orbit. Owing to the inclination of the Earth’s axis, and a good few other things, seasons come and go. If you truly believe you can prevent the Earth cooling, nobody will try and stop you. You can’t even prevent a hot potato cooling by putting it in the Sun. Try it. Surround it with CO2, make a nice little sunshade for it, wrap it in a blanket. Sorry about that, but if heat could be “stored” or “accumulated”, you wouldn’t to able to detect it, would you? Where do you think the energy comes from to affect your thermometer? Unfortunately for you, slowing the rate of cooling does not cause the hot potato to heat up, or the hot beverage you put in your vacuum flask to come to the boil. Not even after four and a half billion years, by the look of things. No wonder “climate scientists” are feeling depressed! In spite of all your wishes, the Earth has been cooling for four and a half billion years. Mike, when are you going to learn to start your posts with something less ridiculous than that? Your suggestion that I wished otherwise was so absurd that I gave up in despair of your ever saying anything remotely sensible and didn’t read any further. But I take it you truly believe no one anywhere in the solar system can prevent Venus cooling. Have you checked that belief with anyone you’re on good terms with? Did they smile approvingly, guffaw, or what? Currently the surface of Venus is at around 740 K.
Which is rather shocking given that the amount of heat from the Sun reaching Venus’s surface is around 25 W/m2, as against around 1000 W/m2 of heat from the Sun reaching Earth’s surface, which at about 288 K on average is well below 740 K.
With that high a surface temperature on Venus with lhat little heat input, say again what you said about preventing a planet cooling. @MF: It’s not an argument. It’s fact.. When A presents P as a fact, B notes not that P is a fact but merely that A believes P. Whether A ever gets to understand B depends on whether A ever gets to understand anyone’s thought processes but their own. Con men make a great living off this principle. Sorry, did I confuse you just then? I assumed we were talking about the Earth, but . . . If Venus originally had a surface temperature of say 5000 K, it too has cooled. Therefore there is no “energy in = energy out”, so beloved as a Warmist starting point. Otherwise, the planet would never have cooled, would it? I will say again, nothing has prevented Venus from cooling from its original molten state, if indeed it was created as a molten blob. Are you trying to propose a theory that all the planets were created at absolute zero, and have since heated up by some miracle of heat transport to the interior over time? If this is so, why does the Moon have such an apparently thick crust, and such an apparently tiny molten core? Do you need more epicycles, perhaps? Just as a matter of interest, Warmists generally are confused about the difference between energy, heat, and useful work. For example, an iceberg at 270 K is radiating about 293 W/m2. This will warm you not at all. You may endeavour to accumulate, trap, or concentrate this heat, but you will not be able to warm one thimbleful of water above freezing with it, no matter how hard you try. Even if you face two icebergs towards each other, and endeavour to double the radiation intensity by using the miracle of back radiation, all you will do is get annoyed and depressed, not to say cold. So yes, if you believe that Newton’s Law of Cooling, and the Laws of Thermodynamics don’t apply to poorly thought out Warmist thought experiments, good for you! If you ever manage to demonstrate the Wondrous Warming abilities of that wonderful and most beneficial plant food, CO2, then I’m sure that someone will find a use for it. With any luck, you might get the “Greenhouse Effect” renamed the “Pratt Effect”, in your honour. Wouldn’t that be neat? It isn’t the heat production but the conversion of wild areas to asphalt/buildings/dirt..
Green areas lose heat by evaporation. Manmade areas lose heat by heating the air (conduction/convection). It is manmade warming because all the man altered areas warm the air. Your following remarks looked very reasonable, PA, but what was your “well, no” in response to? Well, no, I don’t buy the “its power generation” theory. The terraforming dwarfs energy production as a heat source. A asphalt road in Virginia (according to the highway department) gets over 30°C over ambient during the summer. Plant surfaces are close to ambient temperature. Now total energy consumption in the US in 2011 was 97 quadrillion BTU or 2.913 GW. The US is 9.857 million km². So the “forcing” from energy consumption is: 0.2955665387 W/m2. The forcing from CO2 (from 0.2w/m2 for 22 PPM) is 1.05 W/m. For the US and the US only you could make an argument that energy production forcing is significant relative to CO2 forcing (about 1/3 of the CO2 forcing). But that isn’t true for the rest of the world. So the effect of energy production is down in the noise but the UHI if not properly compensated for could produce significant skew. Pingback: Pre-traumatic stress syndrome: climate scientists speak out | Climate Etc. Well, dang, looks like we might be headed for another cold alarmist scare. Will it ever end???!!! Wow, scary. Good thing we had the foresight to stick all that extra CO2 into the atmosphere. Oops, sorry, forgot I was on CE for a moment. Greenhouse gases can’t act as a thermal insulator, mea culpa. 1.6 wm6^2 or greater would be troublesome if persistent. Won’t it be funny if poleward ocean heat transport is controlled by solar and the ‘it’s the sun, stupid’ people were right all along? What are you talking about? We were right all along. Nothing funny about it. On a 20-year cycle, that is, which has no bearing on global mean surface temperature averaged over 2080-2100. 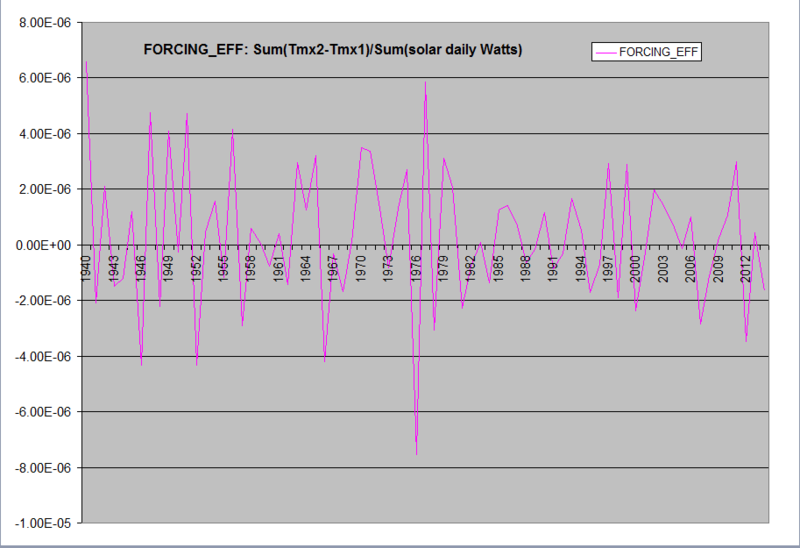 VP, solar never varies except on a 20 year cycle? Citation for the lack of variation? Citation for the 20 year cycle? No problem. No insulator ever made can stop cooling. I could be wrong, but I think not. Your example of the perfect insulator? I thought not. Maybe you could try to introduce the concept of the Wonderfully Warmist Wun Way insulator, which allows energy in, but not out. A practical example would help. A frictionless surface is not particularly useful in a practical sense, nor is a Wonderfully Warmist Wun Way insulator. Give it your best shot, anyway. Vaughan Pratt: Oops, sorry, forgot I was on CE for a moment. Greenhouse gases can’t act as a thermal insulator, mea culpa. You surely don’t think Mike Flynn is representative of CE denizens, do you? Most of us ignore him after disputing him once or twice because he obviously does not understand the basic theory. My inference is that the dominant view here is the “lukewarmer” view: CO2 in the atmosphere slows Earth cooling, but the deleterious effects of future CO2 have been greatly exaggerated, except for those that have no evidence at all..
Vaughan Pratt: On a 20-year cycle, that is, which has no bearing on global mean surface temperature averaged over 2080-2100. 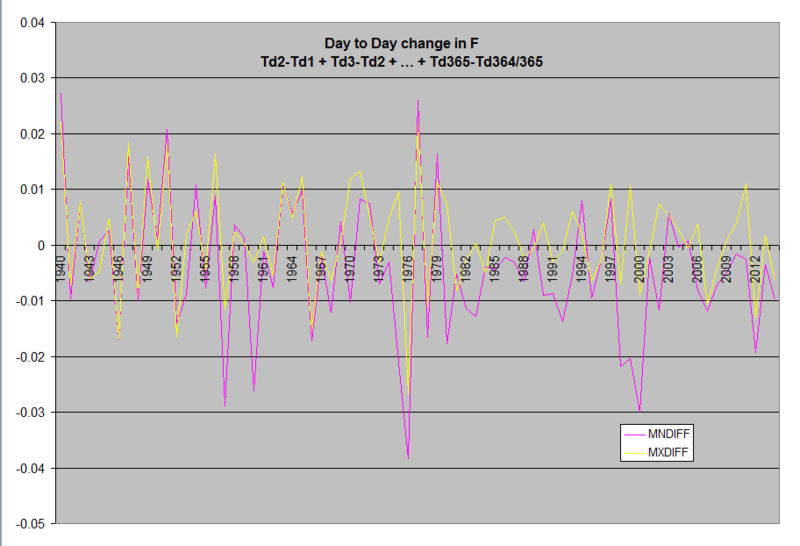 What accounts for your belief that the only important solar variation is a 20 year cycle? Solar scientists, some of them anyway, tell a different story, as in the quoted Daily Mail news item. Beta – Your statement “…so far, only rising concentrations of CO2 offer a reasonable explanation for what is happening.” is demonstrably not true. The analysis at http://agwunveiled.blogspot.com achieves R^2 >0.97 since before 1900 with no influence from CO2 used or needed. An understanding of the relation between mathematics and the physical world applied to extant assessments of CO2 level and average global temperature over the Phanerozoic or any part thereof leads to the conclusion that CO2 has no effect on climate. Dan Pangburn, the topic of Judith’s post primarily concerns what papers in climate science are viewed as being most important by professional climate scientists, as surveyed by Carbon Brief. In view of the fact that the Hockey Stick is the most important and persuasive line of independent evidence that AGW is occurring, I find it odd that the Mann et al papers are not being given the prominence they deserve in the Carbon Brief opinion survey. In any case, you have your own opinions as to what is or is not valid climate science, But few in the general public currently have any serious incentive to examine your opinions and then to judge their basic validity and worth versus what the great majority of professional climate scientists are now saying. This situation would change dramatically if the US Government ever started taking the kinds of actions it needs to take to ensure that President Obama’s goal of a 28% reduction in carbon emissions by 2025 and an 80% reduction by 2050 is met. President Obama’s goal cannot be met unless the US Government takes decisive action to put a stiff price on all carbon fuels and to raise the price of all forms of energy sufficiently enough to encourage the necessary energy conservation measures and to encourage a faster transition into non-carbon forms of energy. Only when the US Government starts taking truly effective action against carbon emissions will the public debate over the validity of today’s climate science reach a critical mass. Pingback: The Siddhartha heuristic | Climate Etc. Beta – Apparently you are refusing to notice that the majority of climate scientists got it wrong. The CO2 level has been higher than now for most of the Phanerozoic eon (the last 542 million years). If CO2 was a forcing on temperature (which it is not, in spite of it absorbing some of the 15 micron radiation from terrestrial radiation spectrum, which is mostly spread over 6-100 microns) there would be no life as we know it on this planet. Regardless of the damage that might be done to the US economy, the CO2 level will continue to increase (as though that mattered). True average global temperature (AGT) is in decline. Reported AGT is being temporarily propped up by el Nino. When el Nino becomes la Nina and (secondarily) average daily sunspot numbers drop below 34 (both of these will happen) reported AGT will see a steep and extended decline until at least 2030. Humanity should get off this misguided attack on fossil fuels and focus on things like intelligent management of fresh water and what to do about the decline in growing season. I cancelled getting the monthly abstracts sent by Nature Climate Change feeling strongly that the papers are not high quality and are advocacy, failing to ask questions on all sides of the issues. Papers are submitted online. Each new submission is assigned to a primary editor, who reads the paper, consults with the other editors and decides whether it should be sent for peer review … Like Nature’s other research journals, Nature Climate Change has a team of full-time professional editors, who are PhD-level scientists. In addition, Nature Climate Change has an External Advisory Panel in the areas of social sciences, policy and economics to provide advice on submissions in these areas in the initial few months. The corresponding author is notified by e-mail when the editor decides to send a paper for review. Authors may suggest referees; these suggestions are often helpful, although they are not always followed. By policy, referees are not identified to the authors, except at the request of the referee. … SO THEY ARE SENT TO THE SAME REFEREES. When making a decision after review, editors consider not only how good the paper is now, but also how good it might become after revision. In cases where the referees have requested well-defined changes to the manuscript that do not appear to require extensive further experiments, editors may request a revised manuscript that addresses the referees’ concerns. The revised version is normally sent back to some or all of the original referees for re-review. The decision letter will specify a deadline (typically a few weeks), and revisions that are returned within this period will retain their original submission date. In cases where the referees’ concerns are more wide-ranging, editors will normally reject the manuscript. IF THE EDITORS FEEL THE WORK IS OF POTENTIAL INTEREST TO THE JOURNAL … THEY MAY EXPRESS INTEREST IN SEEING A FUTURE RESUBMISSION. The resubmitted manuscript may be sent back to the original referees or to new referees, at the editors’ discretion. In such cases, revised manuscripts will not retain their earlier submission date. In either case, the revised manuscript should be accompanied by a cover letter that includes a point-by-point response to referees’ comments and an explanation of how the manuscript has been changed. An invited revision should be submitted via the revision link to the online submission system provided in the decision letter, not as a new manuscript. My question is whether “potential interest to the journal” means meeting the journal editors’ personal, political and ideological interests … or whether it means presenting science that is worthy of publication because it will further scientific understanding of the subject. The title should be why climate change papers do not matter. CLIMATIC THRESHOLDS – which AGW apparently does not embrace, because the forecast they have put forth through their useless models have not only predicted a warming trend from now to 2100 but they have predicted it to be gradual, and steady. This is not how the climate changes. Rather when the climate changes, Ice Core data CLEARLY shows it is in a step fashion not gradual. In other words the climate does not transition into another climate regime in a gradual fashion but in a step fashion. The upshot of all of this is what I say below which is the essence of how the climate changes which does not seem to be comprehended by mainstream climatologist which is par for the course since they clueless to begin with. My statement below is most important. Climatic Thresholds are always present in the climate system and slight differences in the degree of magnitude change /duration of time in the item or items causing the climate forcing could make the difference between a climatic threshold in the climate system being brought about or not ,which in turn will make all the difference in the world of the x climate out come. This is why AGW enthusiast ,the climate changes in a STEP fashion not gradually. As I have said we have a convergence of climatic items which are phasing together which eventually are going to bring the climate into a cooler regime in a step like down turn superimposed likely upon a jig/saw up and down temperature trend in the meantime with a slightly down bias. Geo Magnetic Field – weakening. Milankovitch Cycles – on balance more favorable for cooling in contrast to 8000 years ago. Land/Ocean Arrangements remaining highly favorable for cooling. Ice Dynamic- S.H. could become favorable for cooling. The above is the big picture in the climate dynamic. For the refined picture of the climate dynamic one has to look at earth intrinsic climatic items. Here are some that seem to be solar related. Clouds, Volcanic Activity, Atmospheric Circulation trends showing a connection to solar activity or lack of it. Other earth intrinsic climatic factors. The “On the Confusion of Planck Feedback Parameters” was actually an interesting paper but since it used Kiehl and Trenberth for its main energy budget numbers has errors. K&T appear to have underestimated Latent and Sensible (convective) cooling and over estimated the atmospheric window by not considering the water vapor continuum. In addition to issues with the 15 micron “penetration” which is really a non-issue, there is an over simplification that involves not considering solar penetration to depth in the ocean which is effectively a second greenhouse effect. As far as simplified models go, Guy Callendar did a pretty fair job. Evidence K&T overestimated atmospheric window? Why do you consider <15um penetration a non-issue? Hockey, you can look at the Stephens et al budget which estimates roughly 22 Wm-2 window from the surface and also has more realistic latent and sensible numbers and error ranges. Stevens and Schwartz also had a paper that discussed energy budget issues. Hockey, for the second part. At the surface conduction rules so actual 15 micron emission is pretty much irrelevant. The confusion basically started with the K&T flawed budget and illustration (cartoon). Re “At the surface conduction rules” are you referring to ocean heat convection/conduction to surface & phase change to WV? Your evidence conduction rules over convection at surface? I was referring to 15um absorption/thermalization of “back-radiation” by ocean skin layer and underlying layers. Hockey, At the ocean surface the the probability of collisional transfer, conduction, is several orders of magnitude greater than the probability of radiant transfer at 15 microns. There is basically no 15 micron path.. Until you reach about 400 mb you don’t really need a radiant model, it is just basic boring thermo except for a fairly small window of about 20 Wm-2 averaged over the whole surface which would be less over the oceans thanks to water/water vapor in the atmospheric boundary layer. A doubling of CO2 will have about a 3.7 Wm-2 “global” average impact but it isn’t very uniform so “average” may not be very useful. Using Kimoto’s method and the more accurate range of energy budget estimates, you would come up with about a 0.8 C increase in “average” surface temperature which should have some reasonable uncertainty range, say +/- 0.3 C. That is about all you can do with any simple model. If you assume a constant relative humidity you get a higher end worst case. If you assume a slab ocean at a fixed SST you get a higher end worst case. There isn’t anything really wrong with making assumptions, you have to, you just need to keep track of your assumptions and investigate alternatives. If you can find a way to avoid reusing the same assumptions you are ahead of the game. So I am not particularly impressed with papers that pick nits with assumptions that should be known to be high, low whatever. I did like Kimoto’s simple paper since it provided an alternative to other simple models. Look at all the widespread hype due to Kerr 2015 about bumblebees caught in a “climate vise” that contradicts hundreds of papers showing landscape changes and pathogens are the major drivers of bee declines, contradicts global warming theory, and assertions are made that even contradict their own results.